We understand that the world of children’s beds can be a complicated one, from bunk beds to cabin beds, high sleeper to day beds….how do you know which you need, and which one is right for your child? For this very reason we’ve created an ultimate bed ‘Whose Who’ guide, to help you understand the choices that are available and ensure that you’re well versed on the array of styles and designs that are available. Sleep is so very important to ensure that children of all ages can meet their full potential in every aspect of their lives, so creating the right sleep environment is a great starting point. Depending on the age of your child, they will spend between 8 and 13 hours a day sleeping and with sleep being so important for a child’s mental and physical development, a good bed and mattress is crucial for your child. Children just love bunk beds! Built with one bed on top of the other, a bunk bed is a popular solution to double your sleep space and help save heaps of valuable floor space too. They’re a great idea for smaller bedrooms too so you can create more play space. As well as the traditional layout, you can even have an L-shaped configuration which means you can include an additional piece of furniture at the side of the bottom bed such as a bedside, bookcase or desk. A bunk bed also makes sharing a room or having a friend over for sleepovers so much fun! There are lots of styles available too so you’ll have fun choosing the perfect one to suit your space. So, whether you have siblings that want to share a room or you simply want to free up more valuable floor space, explore our blog on the pros and cons of siblings sharing a bedroom for more insightful information and ideas that may inspire you to invest in a bunk bed. Think tall! A High Sleeper and a Loft Bed are the same, just two different ways to describe a high bed. Creatively designed to maximise smaller spaces and offer dual functionality for sleep and study. Because they are built high you’ll need to ensure you’ve got enough ceiling height, but there’s plenty of room below for a whole host of things such as desks, cupboards, wardrobes, bookcases and even sofa beds. Perfect for older children who want their own space to chill out. A very common question indeed! They are simply two different terms manufacturers use to describe a similar style bed. Traditionally, a Mid Sleeper bed will have a ladder whereas a Cabin Bed is a slightly elevated single bed which may or may not include a small ladder or steps. Most importantly though, both bed styles are as much about storage as they are about sleeping. If space is at a premium or you simply need more storage because you’re bursting at the seams, a Mid Sleeper or Cabin Bed is designed to maximise floor space within a bedroom. 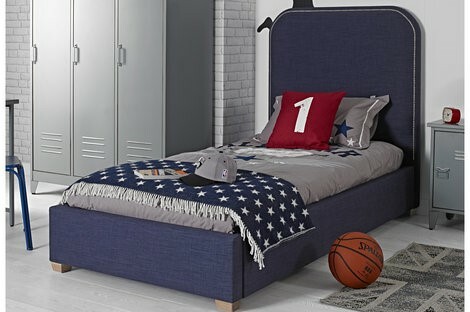 This style offers ‘more than just a bed’ but a complete bedroom solution for sleep, study, storage and even play! Designed for children of 6+ there are lots of designs and combinations available so you’ll be spoilt for choice finding the right one that is perfect for your child. Mid Sleeper, Cabin Beds, High Sleepers and Loft Beds are all excellent space savers and also great fun for children. 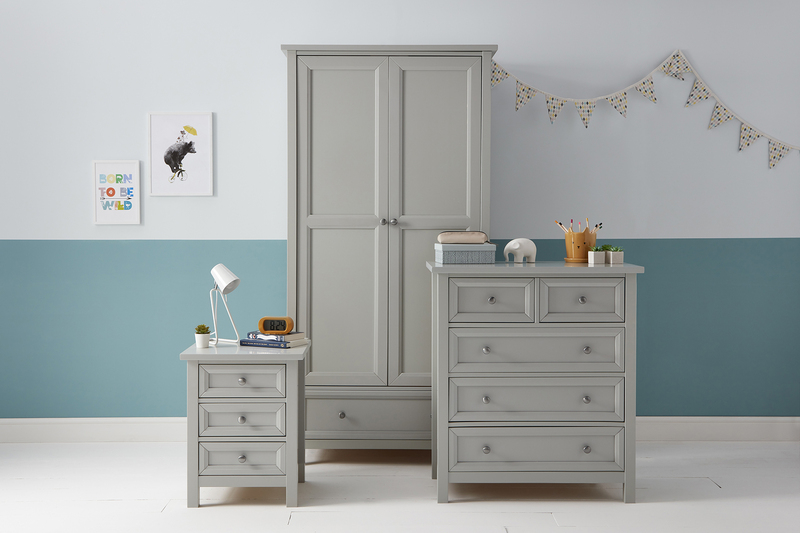 We understand that there’s so much parents need to consider when choosing the right furniture, so take a look at our blog to find our more useful information about the differences and advantages and so you can work out the best choice for your child. A Day Bed is the perfect balance between a seat and a bed so it offers great versatility. It is extremely useful and practical design for all around the home – in the study as a spare bed and a place to relax, a main sleeping option for your child’s bedroom and a popular choice for a guest room. Teenagers particularly benefit from a Day Bed because they can use it as a comfy sofa to hang out in the day with friends or curl up and read a book, and a welcoming bed to sleep in at night. Suitable for toddlers, teens and even adults, a Single Bed will certainly last and last. 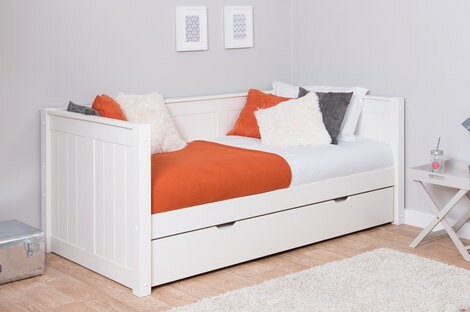 These classic low profile beds are a perfect choice for your child and if you need more storage or a spare bed, many designs come with additional storage or trundle bed drawers so you can really maximise your room to suit your needs. Providing bountiful, valuable sleeping space which is perfect for those weekend lie-ins, you can create a fabulous centrepiece for your child’s room. A double bed has what it takes to see younger children grow into adults as they are built to last. Some styles are available in a small double or standard double size so you can find the right one to fit your space. 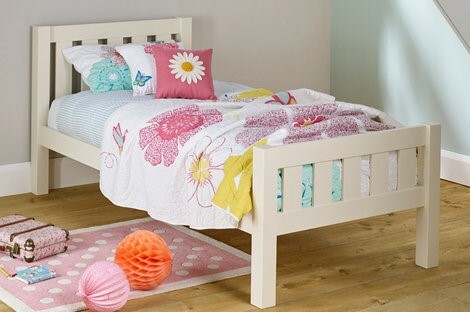 The perfect transitional bed for when your little one moves from their cot to their ‘big bed’. Sometimes big beds can feel too big and become a little overwhelming for your child, so perhaps consider a modular design that literally grows with your child. Or you may prefer to choose a full size single bed with side safety rails which will ensure your little one remains in bed and doesn’t roll out. When your child is big enough, you simply need to remove the side rails et voila, you will have a full size single bed for your child to enjoy and feel all grown up. Upholstered beds will add warmth and luxury to your child’s bedroom. From traditional to contemporary designs to suit both boys and girls, the strong wooden bed frames are covered in luxury fabrics that will last throughout childhood and beyond. Some Upholstered Beds even include a fantastic storage area within the bed frame providing lots of space for bedding, clothes and toys. Another brilliant choice for a sleepover enthusiast! A Trundle Bed is a pull-out drawer that sits underneath the main bed frame. Simply roll it out, pop a mattress in the drawer and hey presto – you will have the perfect spare bed in an instant. You may even choose to use the drawer for extra storage rather than for sleeping. Every room size varies so it is crucial to measure the room to check that your bed frame will fit before you buy. When it comes to buying a bed, naturally you will get more life out of a bed that is bigger, so that as your child grows, you won’t need to replace their bed for many years. Every bed frame will differ in length, width and height, be it a wooden bed frame, upholstered or metal frame, so our best advice is always to measure the area where you plan to place your item. You can use masking tape, string or newspaper to help you visualise how much floor space it will take up. When measuring, always remember to allow for skirting boards, window and door frames, dado rails or radiators etc. We hope you’ve found our guide helpful, and that you’re armed with all the information you need to feel a more confident shopper in the world of children’s beds! 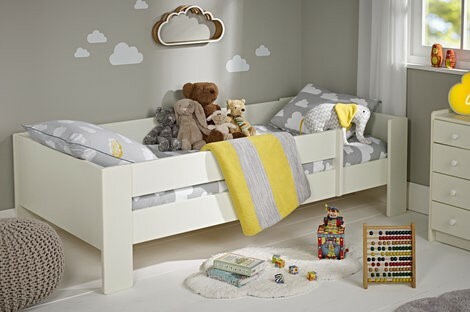 For more tips and inspiration, delve into our website www.roomtogrow.co.uk to discover our fantastic world of children’s beds, furniture and accessories or call us on 0333 006 3096 to chat through your requirements – we’d love to hear from you!